If you’ve ever dreamed of dining under the sea, you may soon get your chance. Norwegian architectural firm Snøhetta recently announced their involvement with Under, Europe’s first underwater restaurant. The new dining destination will be located on the southern coast of Norway, close to the village of Båly. The space itself is a tribute to the Norwegian coast and with such close proximity to nature, the restaurant will also serve as a marine life research center. While we’ve seen underwater hotels and underwater museums in more tropical climates, Under is a unique opportunity to peer below the surface of the icy Nordic waters. Half-sunken into the sea, the structure’s 3.2-feet (1 meter) thick walls shield patrons from pressure changes and will stand up to the rugged waters. “More than an aquarium, the structure will become a part of its marine environment, coming to rest directly on the seabed almost 16.5 feet (5 meters) below the water’s surface,” explains Snøhetta. Acting as a sunken periscope, the large acrylic windows give a perfect view into the waters, allowing diners to eat their meal while admiring the circling marine life. Set over three levels, patrons first enter into a wardrobe room before descending one floor to a champagne bar. It’s at this level that the transition between land and water begins. Watching the transformation through the windows, diners move down to the final—underwater—level, where they will enjoy their meal. The muted palette of the interior mimics the aquatic surroundings, immersing patrons in the full experience. All this is aimed at activating the senses, drawing people below the surface for a greater appreciation of the underwater world. Fittingly, the word “under” has a dual meaning in Norwegian, as it can also translate to signify “wonder.” Over time, as the concrete shell transforms into a mollusk reef, part of that wonder will also stretch toward how humans and nature can coexist with respect and harmony. 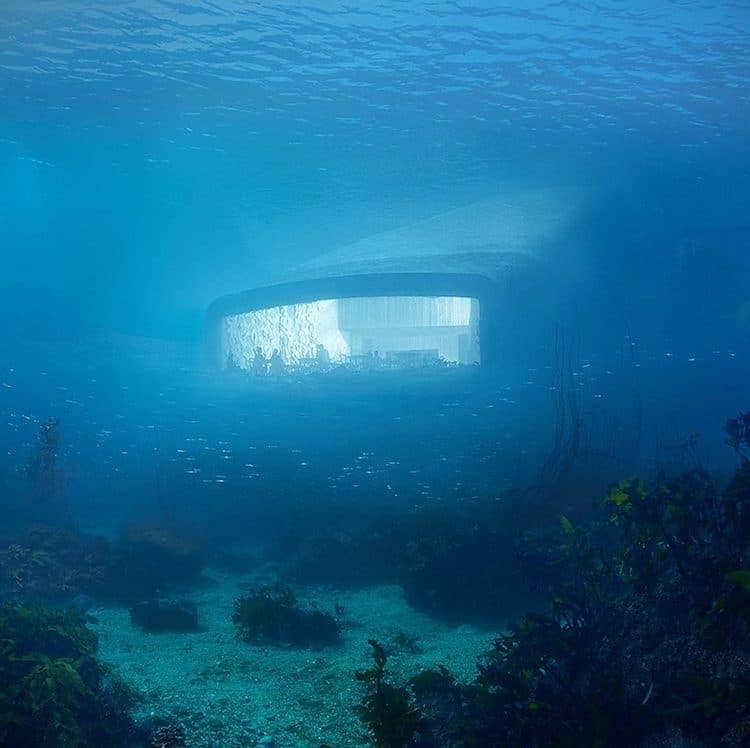 Under—Europe’s first underwater restaurant—sprawls over three levels and will also act as a mollusk reef. The post Europe’s First Underwater Restaurant Is Being Built Off the Norwegian Coast appeared first on My Modern Met.